I really like it thanks Rena! Much like what I asked of your sister I'd like some collage wallpapers my dear daughter. From Ikki Tousen if you will. So like the request I made of ZP I'd like 2-3 images of each character in their wallpaper. I already asked you in PM's so I'll make sure to send you the images for 2 characters at a time so you don't get over loaded heh. No rush so take your time. I'll send you the images first 2 characters tonight. Each time you post the 2 wallpapers I'll send you the next 2. But for now, hear me out! 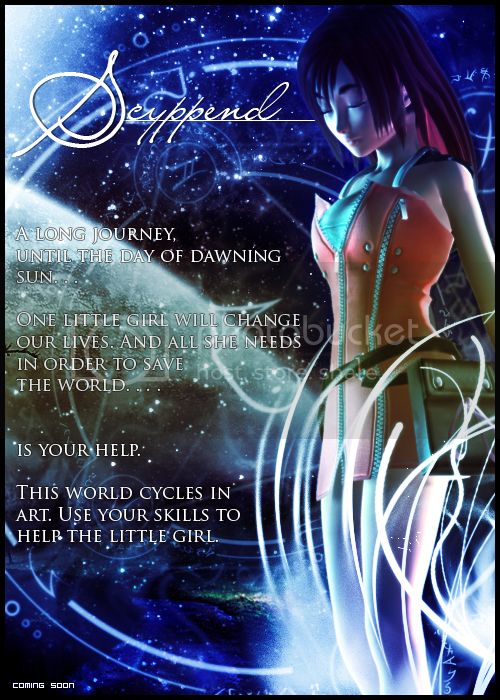 Scyppend: Creator, Shaper; in Old English, it means "to create". Okay, so I thought about making my own contest AND story for all the graphic designers, artists, and writers here just to make this section (and the fan fiction) more interesting. And before you say it, yes. I know there's the Artist of the Month and SOTW topics, and I'm pretty sure there are contests in the fanfiction subsite... that are kinda dead/soon-to-rise again. Think of this as a combination to all of our artistic talents that we can freely use in this Scyppend. A story will be placed, elimination processes, etc. One more thing to answer: Yes, to those who go to YouTube, this idea is inspired from Spazzlings and TheOnlyDoylie. This Scyppend is different, so no worries about that. Want more info? Gotta have enough support. And remember, it won't happen right away. I'd be willing I suppose. I have plenty of time. And awesome. At least I got some people interested. So yeah, that's the unique contest/story to this. And again, writers, artists and designers can be interested in this. Yes, the little girl is Kairi, and you all know she traveled through many worlds to save Sora, right? I decided, why not she be the heroine to this story. It kinda feels like Eternal Sonata, but in order for her to save the world from the dangers ahead, art is the key to the door. 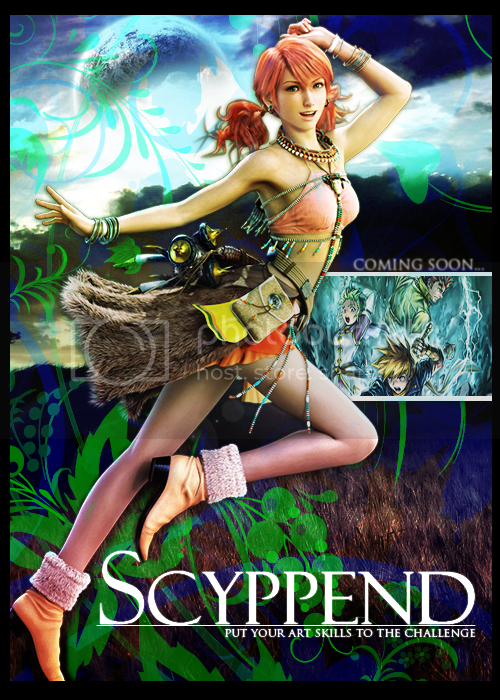 And that's what Scyppend means, to create art and such. On the day of summer solstice is the gathering of chosen heroes/heroines. So what should I be doing again? RENA, can you make a sig using those gifs i posted in the gif thread? iwatch2muchanime wrote: RENA, can you make a sig using those gifs i posted in the gif thread? Out of curiosity, do you have a 360? I wouldn't mind playing you in BlazBlue sometime when I get my gold account back. are these sigs ever happening lol?